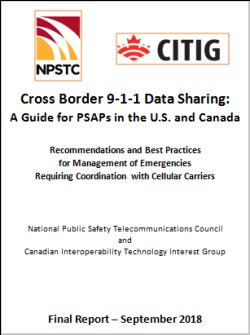 NPSTC and CITIG Release Report, Titled "Cross Border 9-1-1 Data Sharing: A Guide for PSAPs in the U.S. and Canada. Recommendations and Best Practices for Management of Emergencies Requiring Coordination with Cellular Carriers." Every day, approximately 657,000 calls are received by U.S. public safety agencies via the 9-1-1 network – seventy percent come from wireless phones. Emergency incidents frequently occur near the border between the U.S. and Canada. It is not uncommon that a 9-1-1 call placed near the international border may result in the wireless telephone signal reaching the cellular tower that is located in another country. Unintended roaming creates significant problems for PSAPs along the international border. A mobile caller reporting a heart attack located in the Detroit area may reach a Canadian PSAP in Windsor. Likewise, cellular calls reporting a house fire in New Brunswick, Canada, may be answered by a U.S. PSAP in the State of Maine. These calls must be transferred or relayed to the correct jurisdiction in the other country before law enforcement, fire, or EMS services may be dispatched. Roaming Caller Routed to Visiting Country PSAP: A person in distress has crossed the border and their cell phone has roamed onto a cellular network of the other country. They have dialed 9-1-1 to report an emergency in that country. Local Caller Misrouted to Other Country PSAP: A person in distress in their home country has dialed 9-1-1, but their cell phone signal has roamed and their call is routed to a PSAP in the other country. They are reporting an emergency in their home country. Third Party Caller: A third-party caller is reporting a person in distress who is not located in their home country. Non-Emergency Request for Criminal Investigative Assistance: A public safety official requests cellular account information or location data to aid an ongoing investigation. Join the Cross Border Working Group from 12:00–1:00 p.m. ET on Tuesday, October 2. The 9-1-1 Data Sharing Report will be presented at this meeting as well as updates from the FCC and OEC on cross border initiatives. This will be the final meeting of 2018. In 2019, the group will meet quarterly in February, May, August, and November. Announcements on future dates and times will follow. The LMR to LTE Integration and Interoperability Working Group Will Meet from 12:00–1:30 p.m. ET on Wednesday, October 3. The group is finalizing its upcoming report on Mission Critical Push to Talk (MCPTT) User ID and how first responder identity may be managed. The Public Safety Internet of Things Working Group Will Meet from 12:00–1:30 p.m. ET on Thursday, October 4. The group will begin a review of the eight use cases which were created to illustrate varied uses of public safety IOT in order to document additional benefits and barriers. This session is a great opportunity to hear a discussion on how Public Safety IOT will impact first responders. The Radio Programming Compatible Requirements (Radio PCR) Working Group Will Hold its Quarterly Meeting on Thursday, October 4, from 2:00–3:00 p.m. ET. The group will have any final discussions on the Version 7 updated PAM Tool and review next steps. Following this meeting, the group will move into a monitoring status within the Interoperability Committee.